Marisa: This collection is so preptastic, which you know I love. Investment banker fathers, socialite mothers, dead presidents’ birthplaces, etiquette school, and of course, the Upper West Side. Though the stories are all set in different places—Arizona, Texas, Italy—it had a very East Coast feel to me. But then I may just be transferring that over from The Starboard Sea, Dermont’s novel from last year (which, by the way, was one of my favorite novels of 2012, and which is now out in paperback for those of you who missed it the first time around). Casey: I didn’t read The Starboard Sea, though I definitely remember you telling me how much you loved it, and how it was very preptastic and East Coast. So, I suppose it makes sense that Amber’s second outing followed suit. But, I didn’t feel East Coast, except for the moment in “Number One Tuna,” where they referenced The Great Gatsby! You probably missed the reference, since you still haven’t read the book…Sorry. That’s for another time. Marisa: Of course I got that reference. I was just waiting to see if you got it. Casey: Of course you did. Marisa: Were there any standout stories for you in this collection? Casey: This is a really hard question, but one that I knew you’d ask…So, while reading, I kept thinking, “Is this one of my favorites?” And there were only a few. But now, after I’m all done? It’s much easier to tell you the stories that didn’t do it for me: “Damage Control,” “Assembling the Troops,” and “Camp.” That’s it. Three. The rest of these stories were Good with a capital G. But I needed to finish the whole collection before I realized how Good they all were. “Assembling the Troops” was the only story in the collection that I flat out disliked. It wasn’t the point of view, though that grew tedious, it was the content: tough guy makes mistakes, regrets those mistakes, vows to do better. Meh. This read like a story written to make people say, “Oh, wow. What a story.” It felt forced. No other story in this collection felt forced. The rest of the book made me say, “Oh, wow. What a story,” because I had no idea how Amber did it. Marisa: OF COURSE you disliked all of my favorite stories! “Damage Control” was one of my favorites! Casey: This is purely coincidental. Although I did know you were going to love “Damage Control.” I thought it was boring. Marisa: How did you know I would love “Damage Control?” Because it’s set at an etiquette school? Also: how could it be boring when there was so much scaaandal to be had?! Casey: Right. The etiquette school was so preptastic. I thought it was boring because I didn’t like the narrator. Also, all of the story happened in the background. Marisa: I did love “Damage Control,” at least in part because it was set at an etiquette school. And also because I loved the dark, unbalanced dynamic between the corporate girlfriend with questionable morals, and her boyfriend, running her parents’ etiquette school under a whole different set of questionable ethics. I’ll admit that “A Splendid Wife” was the story that was kind of a letdown for me. I became really invested in the intrigue and foreshadowing right away, and kept holding my breath for the big reveal, the clever twist to explain how the disappearances of all of these “splendid wives” were connected, only to be left hanging. In the end, I get that the story was really about the recently-widowed investigator puzzling out his emotions, but that didn’t feel like where we were going initially. Casey: “A Splendid Wife” was a strange story, and yet it doesn’t feel out of place in the collection at all. You know? There were a lot of strange moments in these stories, some of them almost supernatural. I’m thinking “The Order” in particular: a psychic vampire and a quasi-hallucinated little boy! Marisa: What?! “The Order” was not about psychic vampires!!! Casey: It was! The narrator references (several times) how her grandmother drains the life out of everyone, including her, and that’s why the grandmother is so old. But then another psychic vampire appears, and the narrator knows it. Which reminds me: I know a novel about psychic vampires. Do you want to read that? Marisa: You have me reading novels about video games and zombies in the next few months. Let’s pace ourselves. I also want to give Dermont snaps [Casey: Snaps?] for her really inventive storylines and characters—a former kidnapee on vacation with her parents, a recently-widowed granddaughter-for-hire on a European cruise, a formerly wealthy housekeeper attending a former-friend-slash-client’s matchmaking event, a Russian bride on the lam—such a wide swath of life was represented. Each story read separate and distinct to me, which is what I’m looking for in my story collections. A literary mix-tape, if you will. Casey: I think I could write more about these stories than there is room in this column. Suffice it to say that I loved the range of this collection. Different settings, different protagonists, different plots. But did you notice how most of these stories involved care-taking? Someone, usually the protagonist, was taking care of someone else (often against their better instinct). It stood out to me. Casey: *slaps hand to forehead* How’d I miss that? You’ve hit the nail on the head (no snark here…100% sincere). Marisa: *little bow* I really appreciated how Dermont experimented with form in the second half of the collection, particularly with “Notes Toward an Anatomy of Pain” (told via a medical patient’s diary entries, conference schedules, various quotes, and interview transcripts) and “The Master of Novices” (told in 15 vignettes introduced via Catholic iconography). Casey: “Notes Toward an Anatomy of Pain” was definitely the most experimental. A collage/scrapbook is an interesting way to present a story. Particularly when that story is strong enough to be told in a traditional manner. And that ending (can I spoil it?) when her tremors all stopped? But then she continued to fake it? Why? The attention? The pain? What a sad ending. It really haunted me. Also, regarding the quiz in the middle of that story, do you think it’s autobiographical? Marisa: I have no idea. But I’m guessing it was just another one of Dermont’s clever inventions. My recurring trouble with these stories was that they just weren’t fleshed out enough. I feel as if Dermont is a novelist at heart, and often I felt like I was just sinking into a story when it wrapped up, either too cleanly or too abruptly. I would have liked more time with each of her characters, even if that meant having fewer stories in the collection. This is actually a compliment—Dermont is a fantastic writer. I just wanted even more. Casey: I disagree with you here. There’s so much in all of these stories! Each one is like a clown car, and we get to watch all of the clowns (the story’s elements) pile out. Damage Control is a clinic for writing meaty short stories. There’s the layer of present action. Then there’s the internal layer. Under that is the layer of external factors affecting the internal layer. Beneath all of that, Dermont gives us the past (sometimes in glimpses, sometimes in large swaths) which continues to affect the present. And she does this in every flipping story. However, if there was any story in this collection that deserved to be its own novel, it’s “Sorry, You Are Not a Winner.” It works fine as a short, but think of what Dermont could have done with 200 more pages. Yes, you heard it here first, I actually want to read an entire book about a cleaning woman who used to be high-society, whose dad has brain cancer and whose mom is an alcoholic, who occasionally sleeps with her employers. C’mon: she has a rhinoplasty technique named after her! Dermont already built the back story for many of the secondary characters, too. (The cigar box with the four rolls of ten thousand dollars? A great detail.) Amber, please write this novel. Marisa: OMG, I’m finally getting through to you! I’m glad we’re reading a novel next, because with all the story collections I’ve read back-to-back (Vampires in the Lemon Grove and Damage Control have followed Stephanie Reents’s The Kissing List and Aryn Kyle’s Boys and Girls Like You and Me) I’m getting way too contemplative and dramatic about the banal occurrences of my daily life. 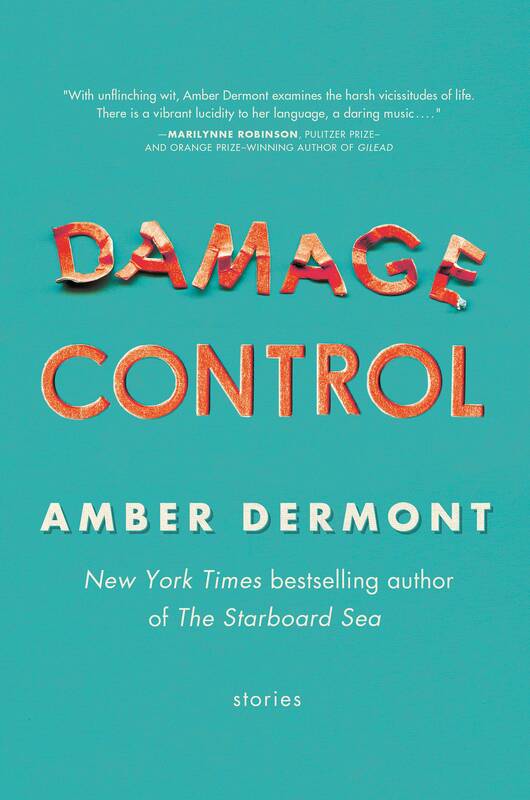 Casey: Damage Control was a really good read, and I like it more the longer I think about it. Amber Dermont is a writer to watch, for sure. Good pick, Marisa! Marisa: Thanks. I do have good ideas on occasion! Casey: I’m looking forward to the novels, too. Story collections are good, but I need something to demand my attention for more than 40 pages. I also think the novels will draw more of a line in the sand for the two of us. It’s easy to find/like at least a few stories in a collection, but if you don’t like a novel…you’ve just got the novel. Marisa: Speaking of novels, next month Casey and I read Jennifer Close’s new novel, The Smart One! What Books Are Better Read Slowly?